A Home Front Command drill testing air raid sirens in the north on Thursday panicked students who were unaware the test was taking place. The practice has become routine as Home Front Command continues its efforts to prepare Israel's citizens for whatever may soon come their way from surrounding Arab nations, as well as from its enemies within, be that war, or peace. 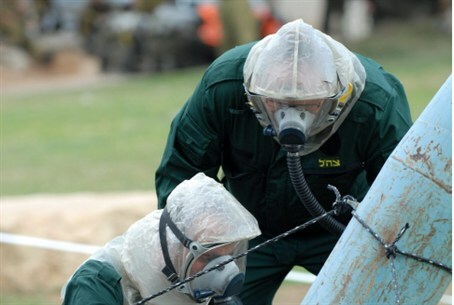 The IDF had continued testing air raid sirens Thursday with drills in the north and in Jerusalem. The first test was conducted in the Galilee at about 10:00 a.m., but in one school in the Tzfat area, a number of students went into a panic, not realizing the siren wasn't real. "They didn't let the school know! Why didn't they let the school know?" a student exclaimed in an interview with Arutz Sheva following the drill. "Two girls panicked, and then we walked quickly downstairs to the dorm mother," she continued. The student requested anonymity since she was not authorized to speak to media. "We didn't go to the shelter," she added, admitting that because several other students had figured out that it was probably a drill, they had decided "there was no need." Still, she said, "There are girls here from all kinds of places in the country, who live in places where rockets have exploded and who could have been traumatized by this. The students should have been told," she contended. Later in the morning, the student discovered that other students also were frightened, prompting school officials to attempt to soothe the girls by making an announcement over the intercom that the siren was, in fact, only a drill and not to panic. Earlier this week, a similar drill was conducted in communities in southern Israel, in Israel's northeastern Negev region, and in the upper Galilee the day before. Late last month, terrorists in southern Lebanon fired a barrage of four Katyusha missiles at northern Israel in an attack that military analysts reviewed to determine whether it might be a harbinger of things soon to come. One struck a gas tank, which exploded. A second struck a chicken coop in an agricultural community. Two others landed in open areas. Although there was damage and people were traumatized, no one was physically injured. The IDF returned fire to the source. Mental health professionals have estimated that up to 80 percent of Israel's population suffer from some form of trauma -- and a significant percentage of those meet criteria for Post-Traumatic Stress Disorder (PTSD) as a result of living with the constant threat of terror attacks.